Ziggy Marley, 2nd generation musician, will be signing copies of “Ziggy Marley and Family Cookbook” at California in October. Throughout the course of his three-decade career, Ziggy Marley has built a music legacy both alongside his siblings with Ziggy Marley & The Melody Makers (ten albums) and as a solo artist (six albums to date). As of 2016, Marley’s music has garnered seven Grammy Awards and an Emmy; the humanitarian, singer, songwriter, and producer continually progresses at every turn. In 2012, he launched Ziggy Marley Organics, which includes a line of GMO-free coconut oils and hempseed snacks. Deeply committed to charity work, Ziggy leads U.R.G.E. (Unlimited Resources Giving Enlightenment), his nonprofit organization that focuses on uplifting children’s lives through education around the world. He is also the author of the children’s book “I Love You Too,” published by Akashic Books/Tuff Gong Worldwide. As the oldest son of Bob and Rita Marley, Ziggy was raised with both traditional Jamaican food and the more natural and healthy “ital” food of the family’s Rastafari culture. 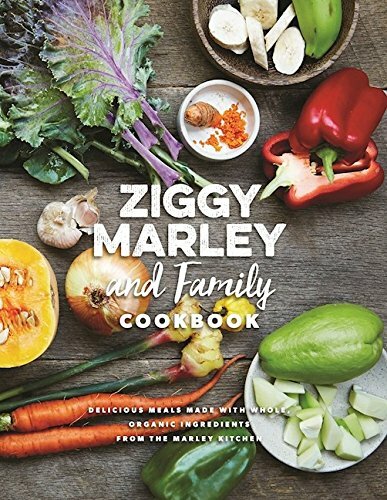 The fifty-four recipes included in the book, inspired by Ziggy’s youth and accompanied by beautiful photos, are contributed by Ziggy, his wife Orly, his sister Karen, as well as renowned chefs Bruce Sherman (Coconut Carrot Curry), Ben Ford (Escabeche, Escovitch), and Leonie McDonald (Caribbean Salsa). Many of the recipes are vegetarian, vegan, and/or gluten-free.